Slyne-with-Hest top the early West Lancashire Premier Division table after three wins from their opening three games. 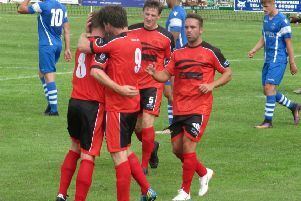 The latest triumph came on Saturday with Coppull United being seen off 3-1 at Bottomdale Road. Captain Tom Entwisle scored a brace, his third in as many games, taking Slyne’s tally to 11 goals this campaign. The former Lancaster City man opened the scoring on 26 minutes with Callum Moore doubling the lead just after the half hour. The hosts didn’t have things all their own way though, Lewis Grimshaw reducing the arrears on 65 minutes. Entwisle made sure of the victory three minutes from time however with his second and Slyne’s third. The Bottomdale Road side had previously seen off Crooklands Casuals 4-0 last Tuesday night. Entwisle scored twice inside the opening half hour against Crooklands with Jordan Lynch scoring a third shortly after. Matty Bell completed the scoring midway through the second half. Slyne next travel to Whitehaven on Tuesday night before visiting Vickerstown on Saturday. Near neighbours Garstang, without a game last Saturday, host Tony Hesketh’s Fulwood Amateurs on Tuesday night.